Did you know that you can trade in your old AMTI force plates to upgrade to the Optima Human Performance System, giving you ten times more accuracy? The Optima Human Performance System is a revolutionary development in force measurement technology, offering a 10-fold improvement over any other force platform system on the market. These force plates are ideal for studying biomechanical gait, sports performance enhancement, and occupational therapy. Optima is also the first force plate to adhere to the ASTM F3019-16 international “Standard Test Method For Verification Of Multi-Axis Force Measuring Platforms”. 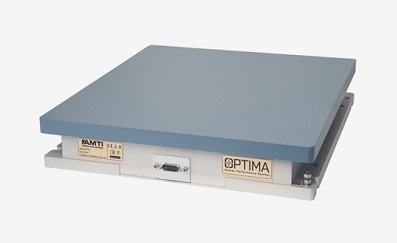 This means that, using AMTI’s newly optimised strain gauge technology, the Optima is the only system to provide levels of accuracy never before seen in force platform technology. Read more. If you would like to take advantage of the trade-in, please contact us and we will be happy to help. AMTI’s industry-leading force platforms and joint simulators are trusted by researchers and clinicians worldwide. Our innovative OPTIMA system revolutionises multi-axis force measurement technology producing the most accurate force platforms on the market. Our smart platform technology and simple digital integration ensures the most accurate output in a convenient package. Read more.